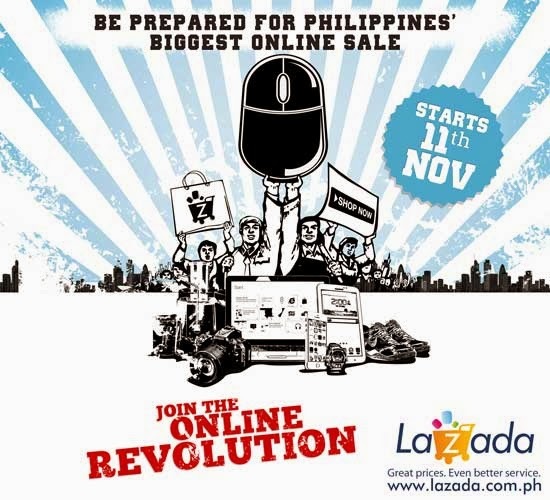 Philippines, 11th of November 2013: LAZADA.com.ph, the biggest online shopping mall in Southeast Asia, today announces the start of the Online Revolution on 11/11/13 (Monday). Every hour from 11AM-11PM, 11 hot deals will be revealed up to 70% off. Apart from that, each hour slot will feature a surprise item that can be purchased for Php11 only! That could be a 32” LED TV, a camera, laptop and other exciting surprises. There’s even more! Lazada will be giving all VISA cardholders a BIG treat (Credit and Debit cardholders). They can get additional 15% off on ALL items on top of the huge discounts Lazada is already giving. Catch it from 2-4pm on 11-11-13. Imagine buying a brand new iPhone 5C for only at Php21,000++ (SRP: Php25,000). Throughout this lavishing week of great deals, Lazada will even feature a bundle campaign wherein selected items will be bundled with awesome items. Plus, a campaign for branded watches, fashion, mobile and tablets etc. with discounts of up to 70% off. Lazada is Southeast Asia’s largest online shopping mall, with operations in Indonesia (www.lazada.co.id), Malaysia (www.lazada.com.my), Philippines (www.lazada.com.ph), Thailand (www.lazada.co.th) and Vietnam (www.lazada.vn). Lazada is pioneering e-commerce in the region by providing a fast, convenient and secure online shopping experience combined with an extensive product offering in categories ranging from mobiles & tablets and consumer electronics to household goods, toys, fashion and sports equipment. Lazada is continuously striving to offer its customers the best possible shopping experience with multiple payment methods including cash on delivery, extensive warranty commitments and free returns.